If you love after dinner conversation, you’ll especially love our decaf espresso pod. One of our mid-intensity espresso capsule coffees, Espresso Decaf is not just brilliant to savour after dinner with friends, but a delicious drink at any time of the day. With a lovely rich roasted aroma, with hints of caramel and treacle, Espresso Decaf is complex yet smooth, with a juicy velvety finish. Thanks to the maximum 15 bar pump pressure in our very stylish coffee machines, creating a coffee shop quality espresso at home is quick, simple and extra delicious. And because our machines are designed to make barista style drinks, your Espresso Decaf is not only high on aroma and taste, but topped with a velvety layer of crema too. The colour of caramel, the silky layer of crema makes our decaf espresso capsule drinks even more irresistible, right from the very first sip. We recommend serving your coffee masterpiece in one of our espresso cups, a wonderful way of presenting your creation at it’s best. Exclusively online, you can’t get our Espresso Decaf pod coffees anywhere else! So, whether you want to enjoy the taste of these delightful espressos to unwind after a long day or with friends, this is an online exclusive not to be missed. If you’ve tried our Espresso Decaf variety, and want to mix up your decaffeinated coffee pod collection, why not give our Espresso Macchiato Decaf capsule a go? It's an average coffe. 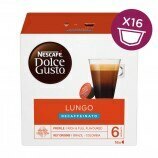 Would be great to be able to buy the "Intenso decaf" to see if it's better. There is a massive difference between the "Barista" "Ristretto" and the Espresso of the non decaf range. It's sold on other sites but not on the official. What a shame! Tastes great - not quite as a rich in flavour as the full caffeine version to me, but without a side-by-side comparison you'd never know. A very tasty coffee. Love a few types of the Nescafe pod coffees (not all), but they are extremely strong and the caffeine drives me nuts if I have more than one, especially the espresso. What you get here is all the taste of rich coffee but without the big caffeine buzz, it suits me much better. Now I can have a few cups a day rather than 1 every now and then as a treat, as I was just too sensitive to the caffeine. 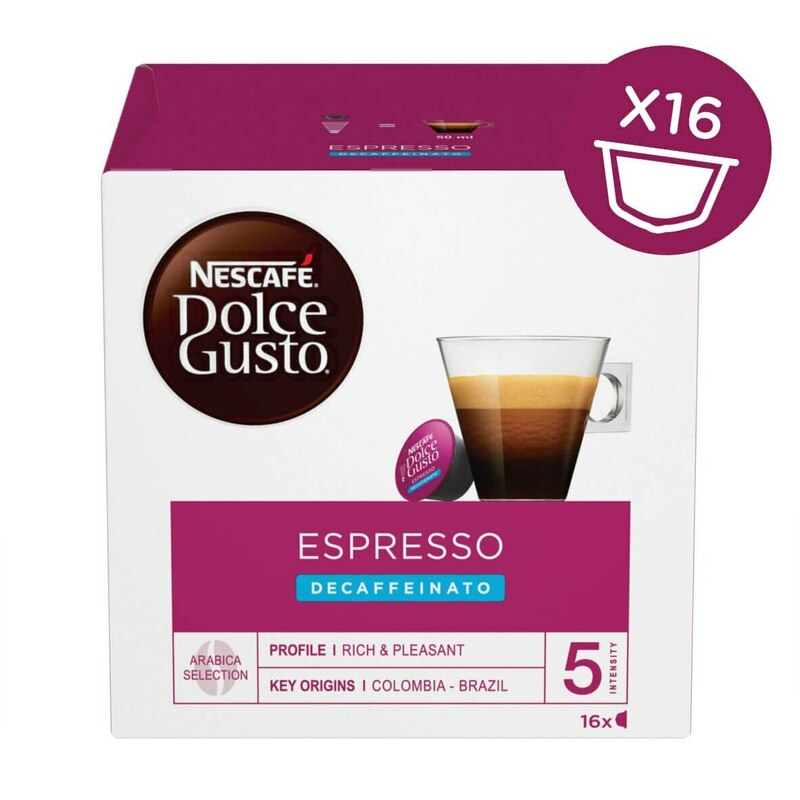 I even supplement these now in my skinny cappuccinos rather than having the standard high hit espresso all the time that they come with, the taste is as good if not better. They were much cheaper on the dolce web site when I was looking also! Its very difficult to tell this is a decaf coffee, it has the same flavour and punch! Also nice with a bit of heated milk. Best Decaf ideal for the coffee lovers. Can't taste the diference. Love It. You would never know its decaf! I'm an absolute coffee lover but recently had to reduce me caffeine intake and found a superb product! You would never know its decaf still tastes great, love the espressos range I heat my milk pop in an espresso and tastes like a good coffee shop coffee.